I was reading this and wondering if you have any suggestions for older children who may not have had “independent play” as infants? Unfortunately I was in college for my son’s first 18 months (he’s 3 1/2 now). Happily my mother wanted to and was able to watch him while I finished my degree, however, between school and my absolute inadequacies as a new mother and him being her only grandchild, I cannot remember how much independent play he really had. My mother and I both intrinsically parent similarly to Magda Gerber’s way (which is why I am so crazy about your site! ), but my son has difficulty being left alone in a room and prefers to be with my husband or me when we are at home. He does not have difficulty focusing on a task or paying attention, but I do think he should learn to be happy to play or be alone more. If he’s used to you assisting him, say, “I know I usually help with the puzzle. Now I’m going to let you work on it yourself for as long as you like.” Bounce the action back towards him. If he says, “Draw a house for me,” respond with something like, “How should the door look? 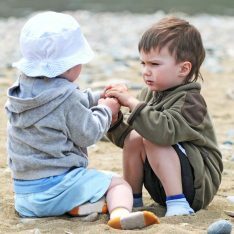 Show me.” Be a patient observer when you play with him, just as Magda Gerber suggests we do with our infants and toddlers. When we join in, our presence can easily take over. 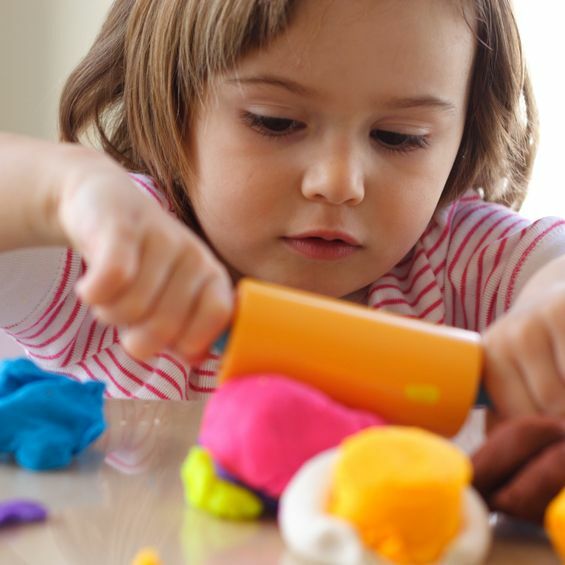 Without us even realizing it, our child’s activity can become all about us. I’ve personally enjoyed the challenge of stifling my instincts to help with or add on to my children’s activities with my ideas, and instead allowing things to unfold. Even after doing this for 17 years, those instincts don’t go away! Inevitably, the children end up doing something far more interesting when I stay out of the action and “wait”. Staying out of your son’s play this way will help him become more self-reliant. He’ll begin to enjoy his independence and won’t need the constant presence of the adults he loves to be happily entertained. And although some children are less tolerant of spending time in a room alone than others, when he wants you nearby he won’t need your attention as much. You can be in the same room, or in an adjacent area, doing your own thing. You’ll probably enjoy hanging out with him even more than you do now when you let him do all the “work”. You’ll learn more about him, too. Thanks for asking, and please let me know how it goes. I have to tell you that I as I write this post (and clear out my overloaded email!) my son has been playing with his “super heroes” cars – as he calls them – without any complaints or insistence that I help! I needed to hear this because I often feel guilty working on my computer when he is around. Thanks for letting me know it’s okay for us both to do our own thing regularly!! Great! I’m so glad to be able to encourage you to NOT FEEL GUILTY for spending time with your son in a manner that is really good for both of you. Thank you for posting. I am in a situation where my almost three year old needs me around all the time. He sometimes does not seem happy unless I am fully engaged! He is in pre-school now (Montessori) and his teached has noticed if not interested in most lessons. He is extremely advanced in his language and it almost seems like I always have to keep him overly stimulated. It can be exhausting and I really want him to experience the wonder of independence. I would like more details! What kinds of lessons does he do in his Montessori school? Did you say he’s NOT interested in the lessons? What do you do to stimulate him? What does he like to do? Hi Michelle, I would love to hear more details as well. I am in almost the EXACT same situation — almost three, advanced language, in Montessori school, but he does participate in his class activities. Just has no interest whatsoever in independent play at home. Exhausting. 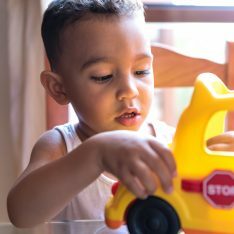 I enjoyed reading this post about fostering solo play even though my LO is 14 months. I have tried to foster her interest in independent play by creating a safe space in our home that she can roam around and she has responded quite well. It’s not unheard of for her to play by herself for 45-1hr. My issue lies with not having much support from my family and sometimes my husband with this approach. My husband doesn’t object to her playing on the floor with toys. However, he feels that there is nothing “wrong” with watching television….his reasoning is “I grew up watching a lot of television and I’m fine.” Case in point today I came down to find that he had turned on the toddler channel and she was sitting on the floor staring transfixed at the tv. I asked him to turn it off, which he did immediately, but it just highlights to me that he doesn’t feel as strongly about television being totally unnecessary. I have the same issues with the inlaws…They feel that LO is missing out because she is not watching t.v. They don’t believe that she should be left to play on the floor but rather put in her “pack n’ play” They are terrified of her falling and hurting herself and so don’t really let her pull up or try and take steps…I’ve had to tell them to calm down on several occasions because they were terrified about the possiblity of my daughter “breaking her head” on a peice of furniture she was trying to pull up on. Don’t get me wrong, I want her to be safe, but I don’t want her to be afraid to try things because she’s scared. Any suggestions on getting the family more in line with this approach to parenting? We have nieces and nephews who have grown up in this very protective environment, (one who is 20 “scared” and really needs her mom to help her with most situations that are outside of family interactions). I don’t want to say hey.. look at so and so she can’t even handle taking the bus at 20…that’s why I’m raising my daughter this way. Sorry this has turned into a vent. We spend a lot of time with extended family and I am constantly defending my decisions. I don’t want her to be afraid, I really want her to be independent and resilient! Any advice would be appreciated! Please never apologize for venting here. I’m going to give some careful thought to answering you. In fact, if you wouldn’t mind, I think it might be my next post! Janet: This is terrific advice. But, I have faced two challenges in trying to implement it. #1 – If I just sit there and watch her, without playing, *I* get bored. But she is able to direct herself (for the most part). What I’ve come up with is leaving the room. This works great at, say, dinnertime, when I actually have tasks in other rooms – but not so well at other times of the day. Plus, even though we have a couple of pretty safe spaces, I can’t help worrying a little when she’s all by herself for a long period of time. I’d appreciate advice from you (or any of the blog readers!). Thanks for your kind words! I’ll try my best to answer you, but have some questions to ask, too. #1 – How old is your daughter? And what do you like to play with her? Are you the kind of person who likes being busy? It’s definitely more challenging for the active “doers” among us to enjoy watching our children play. It’s possible to play with your daughter and still allow her to lead the way, but it takes a lot of restraint. Maybe it would help for you to realize how extremely valuable that inner-directed time is for her. Even when she seems to be just messing around, she is strengthening her imagination, and/or sharpening her motor and cognitive skills. There is probably much more going on than meets the eye. I wish I could be there with you to help point those things out, because I think it could make watching more interesting for you! 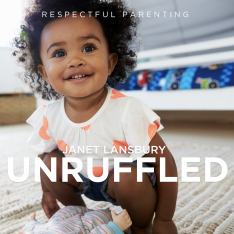 #2 – I realize it’s difficult to immerse yourself in something as focused as reading when your toddler is nearby, because there are often interruptions, but keep in mind that you are making the rules. Sometimes you can say, “Yes” and join your daughter. To help her stay self-directed, stay in responsive mode as much as possible. Other times you can say, “I can’t play with you now, but we’ll spend some time together in 15 minutes.” This might be tough until she gets used to you setting those boundaries for her. Even then, she’ll object and cry sometimes. Tell her you hear her, you know she’s upset, but that you’ll be with her in 15 minutes. Let her express her disagreement with your choices, but stick to your guns! Remember, you are an equal partner in this relationship (although you are the one in charge) and your needs MATTER. You are learning about each other’s needs. It isn’t good for either of you for you to bend over backwards because you don’t want her to cry. Your child’s safety is THE MOST IMPORTANT thing of all. I can understand you not wanting to leave her alone somewhere “pretty” safe. If possible, make a completely secure safe area for her…meaning she can trip and fall, but nothing heavy can ever fall on her, she can’t pull over lamps, play with sockets, go outside on her own, etc. If that isn’t do-able, stay nearby. I recently read and commented on an interesting essay in the New York Times “Motherlode” blog: http://parenting.blogs.nytimes.com/2010/08/25/second-thoughts-about-parenting/ My hunch is that this mom went overboard trying to keep her child “happy”, didn’t take care of herself, and ended up disillusioned and resentful…would love to know what you think. Janet, this is *so* helpful. Thank you. #1: To clarify, my daughter is a delightful 20-month old. And yes, I am a professional who is used to multi-tasking many, many hours a day. It is tough for me to just sit and watch! #2: You are very perceptive – I guess that I do have a couple of concerns about watching/letting her lead! First, as I spend 40+ hours/week away from her, I feel “bad” not giving her my full attention when I *am* home (especially because the other thing I would be doing = work…). Second, I worry about her getting too “bossy” (as a first/possible only child) — she is already a strong leader/director when we play with other kids. Third, as you identify, I do sometimes get bored if I sit there and watch but don’t do anything on my own. That said, based on your other posts, I’ve been trying… and she has been responding *really* well. I think I just have to get over my own guilt (and maybe have a second child, so I can justify not spending as much one-on-one time with my 1st, haha). Yes, please get over your guilt! It is not helping you or your wonderful daughter. One thing I may not have emphasized enough in my recent posts about independent play is that it only works when it is balanced with periods of focused attention. Just make sure that you are paying attention when you change your daughter’s diapers, give her meals, bathe her, and put her to bed. When you do those things attentively you can feel certain you have given her the “quality time” she needs. Anything beyond that is icing on the cake. Don’t worry about your daughter being a bossy leader. Those qualities will serve her well in life as long as you set consistent limits. She is at the age where she really wants to feel those boundaries (even though she doesn’t tell you that). Don’t let guilt get in the way of giving your daughter the boundaries she needs. This is a great post! I have an extremely intelligent and verbal newly 3-year old son and one challenge we’ve always had is playing independently. I don’t understand this, because I did some RIE work with him as an infant, and he did have my focused attention at diapering times and meal times, etc. But, my husband is extremely busy, so most of the time he was used to one on one with mom. But we had another baby in the fall, and now I do have to divide my attention and this isn’t going as well. In fact, especially recently, he becomes very frustrated playing and starts whining or screaming at his toys if he can’t get something to work the right way (like legos or a puzzle) and throws the item. How can I get him to come into a better relationship to play in these instances? to make it worse, he throws up all his breakfastand has lost weight since he joined preschool. We recently set up a yes space for our daughter where she can engage in uninterrupted play with open-ended objects. However, she has a hard time being in there alone. Do you have any suggestions for encouraging her to play in this space while we are in view in an adjacent room? My son is 11 months old. He gets bored easily and is showing tantrums when pushed to do a certain task and starts crying. He does not crawl. Is it ok. How can I make him engage in some activity for long. I am a freelancer. I try to be with my kid mist of the time. But it is not helping. What to do? Fully believe in the concept of self play, the tricky part is getting them to do it. I believe we have pretty good briefs w our son (2yrs old) about how he is going to play by himself for 10mins while I do the dishes, then afterwards we will play cars etc… I calmly say no when he asks me to play or trys to grab my leg to pull me over. We have been doing this for a month but there are still big tantrums and screams which we don’t cave into. Any tips or techniques? Should we try a more subtle walk away approach or stick w the clear boundaries? Does it just take time ?